School Staffing - Therapy Rehabilitation Services, Inc. Therapy Rehabilitation Services has been providing skilled, dependable licensed Physical Therapists, Occupational Therapists, Speech Language Pathologists and Psychologists to schools in Arizona for over 25 years. Our therapists have experience with a variety of age groups and diagnoses including language and developmental delays, autism spectrum disorders and physical disabilities. 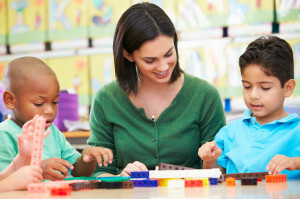 We can provide therapists to schools in the Greater Phoenix area, Tucson and other outlying areas of Arizona. Our therapists are available for full time or part time assignments with a commitment for the school year to ensure continuity of services for your students. Shorter term placements are also available to help you cover for such absences as illness or maternity/family leaves. Bilingual and monolingual therapists and psychologists are also available on an as-needed basis for individual evaluations or therapy. All TRS therapists have been carefully screened prior to being placed in a school assignment. We require an extensive list of credentials and verify the status of licenses and certifications with the State or Board to ensure they are current and unrestricted. TRS’s clinical training director provides a comprehensive orientation to our school-based therapists prior to the start of the school year to ensure familiarity and compliance with all school protocols and procedures. The training will cover State and Federal Laws and programs that apply to schools including IDEA, No Child Left Behind, Medicaid billing procedures, OSHA safety and other topics. HIPPA privacy laws are covered in depth to insure confidentiality in all aspects of school therapy and records. TRS also hosts an on-going continuing education program for our therapists. Our monthly in-service presentations allow our therapists to expand their base of knowledge, keep abreast of new research and treatment methods, and network with other professionals in their field. Interested therapists from the schools where we work are welcome to attend. Our friendly office staff is available Monday through Friday to assist you with your staffing needs. Call today for information on available PTs, OTs, SLPs and Psychologists with the skills and experience that will be a perfect fit for you! The Diagnosis is Childhood Apraxia of Speech… Now What Do I Do? © Copyright Therapy Rehabilitation Services, Inc. | All Rights Reserved. | Site created by Gravy Creative, LLC.